It may have a Northwood's theme, but the first Great Wolf Lodge indoor water park resort on the east coast is in Virginia, near Busch Gardens Williamsburg and Colonial Williamsburg. Although it's just off the interstate and next door to a Wal-Mart, Great Wolf Lodge Williamsburg is set back from the road and maintains its deep-woods ambiance. The log-cabin exterior subtly sets the tone, but there's no subtlety in the lobby. With its animated clock tower, wolves perched atop a mammoth fireplace, and children milling about, there's no mistaking the Great Wolf's focus on family fun. The fact that most of the kids are in bathing suits—no matter the season—gives away its unique brand of fun. The resort is ideally suited for families with pre-teens, although the water park does include a surfing simulator and a funnel ride, attractions with thrill elements that might appeal to older kids. Most of the other rides at the Great Wolf Lodge Williamsburg are more on the tame side, and the general ambiance is geared to families with young kids. In addition to the water park, the resort offers a veritable children's paradise. The whole family will enjoy the spacious suites, top-notch accommodations, and abundant amenities. Teens and other thrill-seekers could get their adrenaline fix on the wonderful roller coasters at Busch Gardens (during its operating season), which is only minutes away. The water park is the main draw, and the Great Wolf Williamsburg offers a generous 55,000-square-foot year-round facility it calls Bear Track Landing. Water park admission is included in the room rates. A pioneer and the largest operator of facilities in the indoor water park industry, the original Great Wolf Lodge in Wisconsin Dells serves as a template for the resort chain. (The company's other hotel/water parks are in Ohio, Kansas, and elsewhere.) Like the other parks, the signature attraction at Bear Track Landing is Fort Mackenzie, a four-story interactive water play center with bridges, net crawls, and a bunch of sprayers, fountains, and other gizmos to get everyone soaked. With a constant 84-degree temperature, even in the winter, getting soaked is a good thing. If the gizmos don't quite do the trick, a huge tipping bucket unleashes a torrent of water every few minutes. Fort Mackenzie also offers a couple of body slides. In the rear of the park, larger slides beckon. Riders can grab single or double inner tubes to challenge the two peppy Alberta Falls slides. (The blue slide is especially peppy.) Or up to four can hop into a circular raft for River Canyon Run. As with most indoor water parks, the covered slides extend outside the building. Because they are enclosed, the slides stay toasty warm, even if the outdoor temperature dips below freezing. The Alberta Falls slides empty into the park's lazy river. While it's not particularly long (it is indoors after all), the river does include a few gotchas, including mini tipping buckets that empty onto riders. Another highlight of the park is its wave pool. It's a fairly decent size for an indoor water park, and offers some good, rolling waves. Other features include an activity pool with water basketball and a pool and play area for young children. Tucked away in a more-or-less remote corner, Bear Track Landing offers two hot tub whirlpools, one for families, and one exclusively for adults (all together now: "ahhhhhhh"). For an extra fee, guests can give the park's rock wall a try. Unlike the rock walls found at theme parks, this one includes jets of water to trip up climbers. In the warmer months, the resort also offers an outdoor pool. 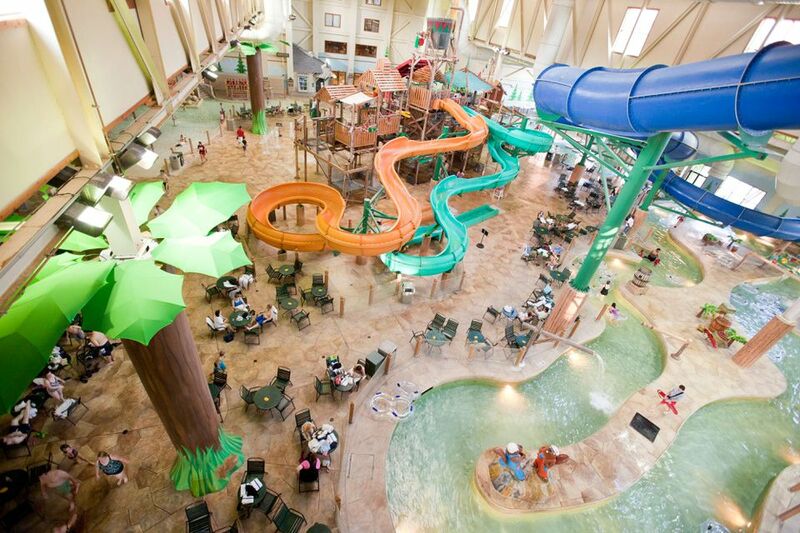 The water park IS the main draw, but Williamsburg's Great Wolf Lodge also offers a daily roster of supervised dry activities that kids can do with or without their families, including contests, hikes, and crafts projects (in the Cub Club Room). It's sort of like a cruise ship itinerary for youngsters. The resort offers most of the activities free of charge. (It does charge a nominal fee to cover the materials for some of the crafts projects.) Each evening, the resort offers a pajamas-optional (it's a family resort; don't get any ideas) story time in front of its enormous fireplace. There is also a huge arcade with redemption games. Great Wolf Lodge also offers a MagiQuest interactive attraction. The extra-charge experience immerses players in a high-tech, multi-player fantasy environment that is somewhat like walking into a video game. It may be a kids' paradise, but mom (and dad) can get some pampering too at Elements, the Great Wolf Lodge's Aveda concept spa. After all that chlorine exposure and wave tumbling, adults may want to rejuvenate their skin and work some kinks out. Services include massages, facials, and nail treatments. Restaurants include the full-service Camp Critter bar and Grille and the cafeteria-style Loose Moose Cottage. It's not gourmet fare, but the food is quite good (if a tad pricey). The resort also features the Bear Paw Café, a sinfully decadent take-out shop crammed with homemade fudge, hand-dipped chocolates, fresh pastries, ice cream, and fancy coffees. All rooms are suites and include a mini-fridge, microwave, and coffee maker. To help keep meal costs down, many guests tote their own food-filled coolers and dine, at least sometimes, in their rooms. You could stock up on provisions at the Wal-Mart next door. The basic family suite, which is fairly spacious, has two queen beds and a living area separated by a 3/4-wall divider. The living area includes a sofa bed. Other room configurations include a loft fireplace suite and a "Kidcabin" suite that includes themed bunk beds. My "Majestic Bear" suite, which sleeps eight and included a separate bedroom, was especially roomy and comfortable. It featured a dining area with a breakfast nook and six stools, although the stools were somewhat low for the counter--particularly problematic for young kids. The king-size bed was comfy and the pillows were oversized and suitably firm (tiny, mushy hotel pillows are a pet peeve of mine). There were two TVs in the suite, but no desk. Overachievers who bring office work to their family vacations could set up shop on the patio table or the breakfast nook. The hotel does offer free wireless Internet access, but the signal can be spotty. In the minor quibble department, the room was on the dark side, even with all of the lights turned on. While there's plenty to do without ever leaving the resort, the Great Wolf Lodge could serve as a base from which to visit Colonial Williamsburg, Jamestown, Busch Gardens, and other area sites. Inquire about specials. If you're able to visit mid-week during slower seasons, you may find some especially good deals. For longer Williamsburg vacations, you could consider staying one or two nights at the Great Wolf Lodge to enjoy the water park and booking lower-priced accommodations for the balance of your trip. The water park is included in the room rate and is open to registered hotel guests only. No tickets or passes are available for the general public. Inquire about specials. If you're able to visit mid-week during slower seasons, you may find some especially good deals. For longer Williamsburg vacations, you could consider staying one or two nights at the Great Wolf Lodge to enjoy the water park and booking lower-priced accommodations for the balance of your trip. To help keep meal costs down, you could tote your own food-filled coolers and dine in your room. All suites include fridges and microwaves. The actual address is 549 East Rochambeau Drive in Williamsburg, Virginia. I-64 heading west, take Exit 234 (Lightfoot/Route 199). I-64 heading east, take Exit 234-A (Lightfoot/Route 199 exit). Take the second Mooretown Road exit off Route 199. At the first stoplight, take a left onto East Rochambeau Drive. The Great Wolf Lodge is on the right. Nearby airports: Williamsburg/Newport News, Richmond, and Norfolk. Just How Great is Great Wolf Lodge Pocono? See the Photos. Is Colorado's Great Wolf Lodge water park hotel worth it?